Now that we’ve all celebrated, high-fived and clinked glasses from our Rose Bowl victory, it’s time to get back to work. Our Ducks have one more game to play this season and it’s the biggest of all… the National Championship game. Come January 12 our Ducks will be in Texas to face Ohio State. If I were Ohio State, I would be shaking in my cleats knowing I had to face our Ducks. This is possibly the best season our Ducks have ever had in the history of the program, and the best group of men are on the field together getting the job done. 1. “Get a stopwatch, because Oregon’s offense is fast. You probably knew that. But exactly how fast? 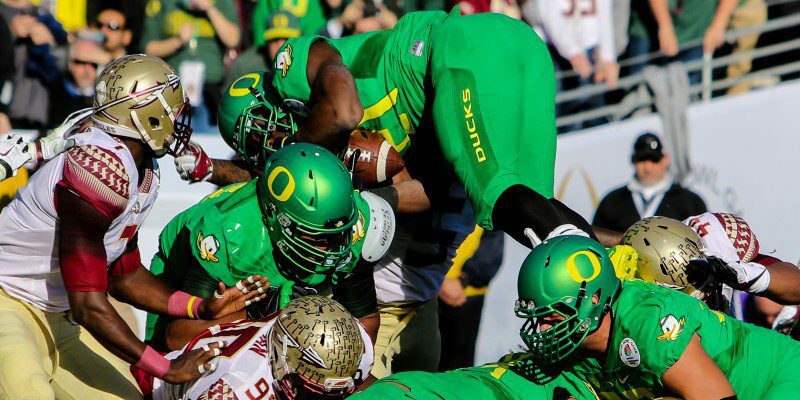 The Ducks ran a play every 20.2 seconds against Florida State in the Rose Bowl according to ESPN Stats & Info.” Yes!! Earlier in the season I talked about how the tempo of our game makes such a big difference in the outcome and if the Rose Bowl didn’t make that completely evident then I don’t know what will. It was so refreshing to watch our Ducks at full-speed again and after the success on Thursday I have no doubt we’ll see that same game tempo come January 12. 2. 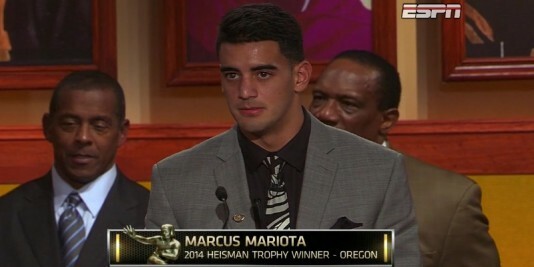 “Oregon’s Heisman Trophy winning quarterback Marcus Mariota leads the nation in quarterback rating, is third in passing yards, second in passing touchdowns, has the fewest number of interceptions of quarterbacks with at least 400 pass attempts … The guy is good.” You nailed it, Landis; we’ve got the best of the best. He might be the nicest guy in college football but he’s on that field to get the job done and 99.9% of the time, he does. 3. “Oregon is third in the nation in total offense, averaging 552.9 yards per game… The Ducks are second in the nation in yards per play (7.39).” Landis also points out that nobody has scored more touchdowns than our Ducks this season (88). Whether it’s our lineman, our backs or our quarterback, our offense is solid and the Buckeyes should watch out for every single player on the field. 4. “When the teams meet in North Texas, you might see an offense that looks eerily similar to Ohio State’s. Urban Meyer and Chip Kelly have had a relationship since Meyer was at Florida, and have talked about everything from plays to how to run the ball.” This particular point is one that I suppose both teams have to watch out for. However, we may run similar plays, but who runs them better, faster and more efficiently? 5. “Oregon’s offense is fast (thought that bears repeating), but could be without its fastest player against Ohio State. Receiver Devon Allen injured his knee returning the opening kickoff against Florida State and is expected to miss the national title game according to FoxSports.com’s Bruce Feldman.” Sad but true; one of our most valuable players, Allen didn’t make it past the first play in the Rose Bowl. But if the Buckeyes think that not having Allen on the field will make or break this game, I’d like to remind them that we have been without Pharaoh Brown for a while and have still done well — and now without Ifo Ekpre-Olomu. Not to mention we have had multiple key players in and out throughout the entire season. Don’t get too excited, Ohio State — we may be missing Allen but our Ducks always have the next man up ready to do what has to be done when a teammate has fallen. Erick Dargan with the ball in the Michigan State game earlier in the season. 6. “Let’s take a look at what the Ducks and Buckeyes offenses did against their only common opponent: Michigan State.” Yes, our game statistics against Michigan State are somewhat similar but, not to burst your bubble Ohio State, we played Michigan State our second game of the season and are not the same team we were then. We are stronger, faster and smarter than in Week 2 and although it is a good comparison, I wouldn’t consider it necessarily valid going into this game. Again, we truly have the best of the best and there’s not just one player you can focus on when it comes to taking down our offense. With Mariota leading us and a very strong and determined group of guys assisting him, we’re could be unstoppable. May the best offense win.